Spring and Summer are the best seasons for some of my favorite fruits, particularly berries. This raw delight is a perfect cool, creamy treat while enjoying the sun. The rich vanilla base, strawberry swirl and chocolate crust come together for the perfect dessert combination. 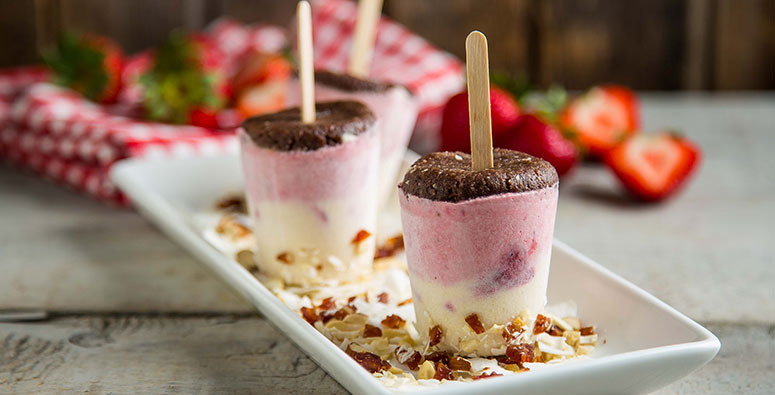 Note: If you are looking for a bite-sized dessert, try making cheesecake pops on a stick! Save some of the chopped strawberries to create layers. Combine all ingredients in a food processor (reserve ½ the date paste) and process. If it starts to rise up the sides, push it down until everything is well combined. Add the 2nd half of the date paste and process. Distribute crust evenly on the bottom of lightly oiled pan (using coconut oil). Put a little coconut oil on your clean hands to get the crust in the pan. I found this keeps the crust from sticking to your hands—a very frustrating experience. Refrigerate until filling is ready. Combine all ingredients for filling except for coconut oil, lecithin and strawberries. Blend well until smooth and creamy, about 5 minutes. Stop blending and add the lecithin and melted coconut oil then blend until smooth. Remove 1 ½ cups of the mixture and set aside. Put the original mixture in the pan containing the crust. Take the reserved filling and add the strawberries. From here you can swirl or layer depending on what you want to go for! When you are done swirling or layering, freeze for 1-3 hours or until middle of cheesecake is firm to the touch. Paige Snyder works at Vega as a Regional Educator. She is a plant-based nutritionist who specializes in sport performance, stress management, and achieving your optimal weight. Paige is currently completing her Masters in Nutrition from the University of Bridgeport, and loves to develop raw dessert recipes.